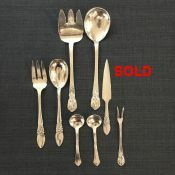 Our online collection of antique and vintage sterling silver items by Petersen. For a greater selction please visit our shop. A sterling silver pedestal serving dish by Carl Poul Petersen Measures 5.4cms (2.1 inches) tall. A sterling silver pedestal serving dish by Carl Poul Petersen. Measures 5.4 cms (2.1 inches) tall. A sterling silver cup by Carl Poul Petersen. Measures 9cms (3.5 inches) tall. With open bud decoration around base. Sterling silver salad servers by Carl Poul Petersen. Measure 25cms (9.8 inches) long. With organic ornamentation on the ends of the handles. A sterling silver pedestal serving dish by Carl Poul Petersen. Measures 7cms (2.8 inches) tall.